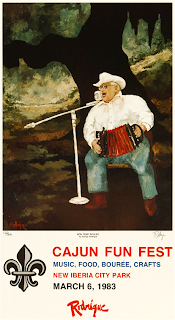 In 1985 George Rodrigue painted the great musician Clifton Chenier (1925-1987). At the time, Chenier was world-famous, crowned a Grammy Award winner in 1983 and summoned everywhere from San Francisco to Switzerland to share his unique Louisiana sound. Rodrigue’s timing in painting the portrait honors Chenier not only for his music, but also for his passion and perseverance, as he entertained crowds throughout his struggles with diabetes and kidney disease. I asked George Rodrigue if he ever met Clifton Chenier. Gold? I asked George, imagining the car. “They were all gold,” he laughed. Rodrigue’s portrait is typical of both the musician and the artist. Chenier wears his trademark rings, headband, and smile while playing the accordion. He stands not on a stage, but framed within the branch and trunk of a Louisiana live oak, a strong shape developed within Rodrigue’s earliest landscapes. 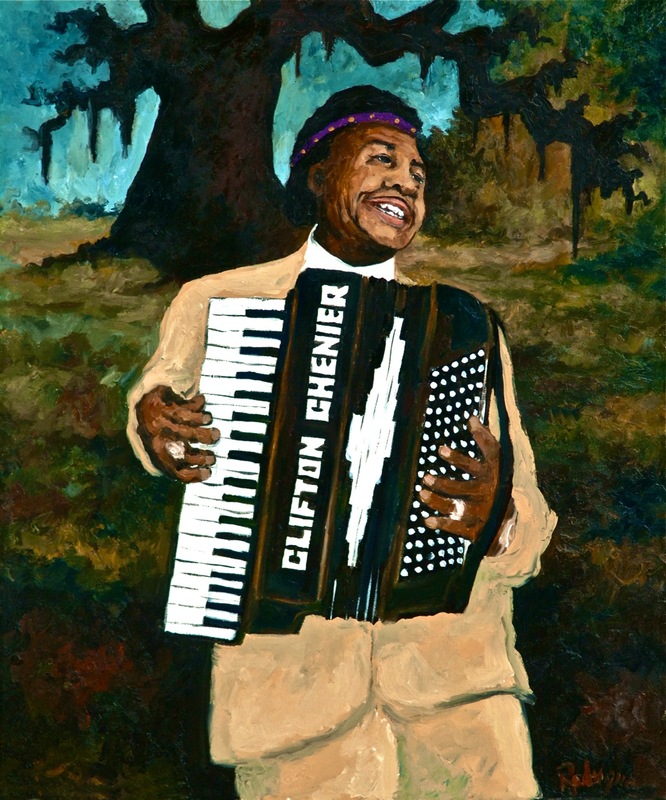 Chenier was the third of Rodrigue’s portraits featuring an accordion player. The first, in 1971, honors Iry LeJeune (1928-1955), the blind musician who by all accounts influenced every Cajun musician following. (Click photo to enlarge; read a detailed history of this painting here). 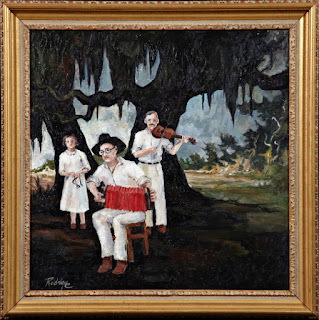 And in 1983 Rodrigue painted Clay “Baby” Meaux in a painting celebrating New Iberia's Cajun Fun Fest. 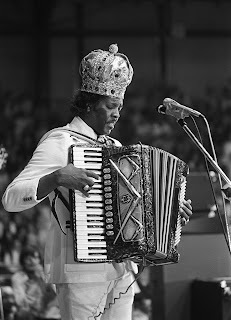 In 1975 photographer Philip Gould captured the King of Zydeco, Clifton Chenier (above; be sure and click to enlarge), at the Cajun Music Festival in Lafayette. Known for his personal and documentarian interpretations of Louisiana’s land and culture, Gould* is also a musician, partial to the accordion, a passion uniquely linked to his subject, including an ongoing series of "Accordion Portraits." You realize the French word for oak is "chene"? I'm sure Chenier is derived from it: what could be more appropriate?! I used to dance to Clifton Chenier at Grant Street. I will send this to all of my zydeco dancing friends in the U.S. and abroad. Thank you, Melissa. And congratulations on your new gallery!